Ok so I am a little bit excited – we are starting Spring Detox!!!! This is a man who grew up on American diet – pizza, beer… It was a while ago since he joined healthy living, but I still get surprised when he asks me about detox. First time he did detox “just for me” – to please me. After he got tons of compliments how ‘fresh and healthy” he looks and how great he felt after the detox, now he is the one who reminds me that it is time to do a detox. I am so excited. I have a few people who will be joining us already. You can read testimonials (http://bit.ly/1szqaW2) about my detox and contact me directly if you have any questions. Why do we do detox? There are a lot of reasons. But there is one especially important for me – to keep my thyroid and immune function at the optimum level. I was diagnosed with “thyroiditis” over 15 years ago. Doctors didn’t give the diagnosis of Hashimotos thyroiditis then even my thyroid antibodies were elevated. Over the years I had suffered with hypothyroidism and everything that comes with this disease. Diet and lifestyle made huge difference how I feel, even I still continue taking hormone replacement therapy for my thyroid. By detoxifyling my liver and cleaning my gut, I feel like a normal person. Do I like a process of detoxification? No, I don’t. But it is only 2 weeks once or twice a year. I can hande it. Anyone can handle it. In preparation to detox I purchased Cleanse & Restore Kit to support cleansing process of liver, kidney and skin, also to do candida and parasite cleanse, to restore GI tract. I find that first day is always overwhelming. It goes a lot of reorganizing meals and daily routine. I have to pay attention when and what I will be eating. I am a habit person, so I feel a bit out of my comfort zone. Plus I have to think about my husband as well because he is in this journey with me. I am not hungry. If anything, I am full of excitement. It’s a family detox. Feeling energetic, not hungry, slept well. 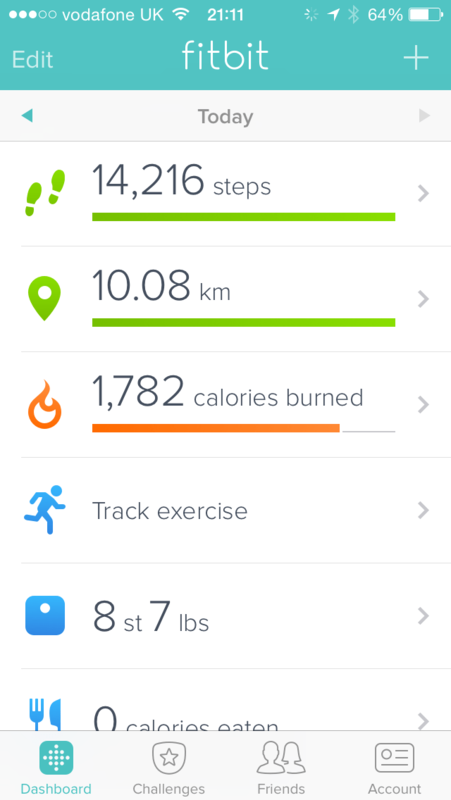 Yesterday we went for a nice long walk, made my steps for a day – 15.000! ‪Feel good about myself‬ 🙂 Today my goal is to pay attention how my body and see what it really needs – exercise, rest, food, pampering, etc. Today woke up alert and rested before my alarm clock went off. Yeah 🙂 Love early mornings. I had extra time for a ‪yoga‬! One thing I noticed, every time I do detox, I have lots of energy first thing in the morning, need less sleep, and my flexibility is much better. I get time to time stiffness in my hips (not unusual sign with ‪‎thyroid disease‬ I have), but during detox, it seems to melt away. Everything is going extremely well. I leaned that I need to pay extra attention to my adrenals. Adrenal health is very important foor the healthy thyroid function. During detox, I give an extra support to this gland by adding extra Vit C, sea salt, rest, relaxation. Energy is still good. No coffee or tea needed to get me going in the morning nad it satys throughout the day. I love this continues flow of energy without dips and cravings. Although I noticed that I am ready to go to sleep earlier. Love to use oil diffuser to help detoxification process and relaxation. Today will be our last pre-detox day. 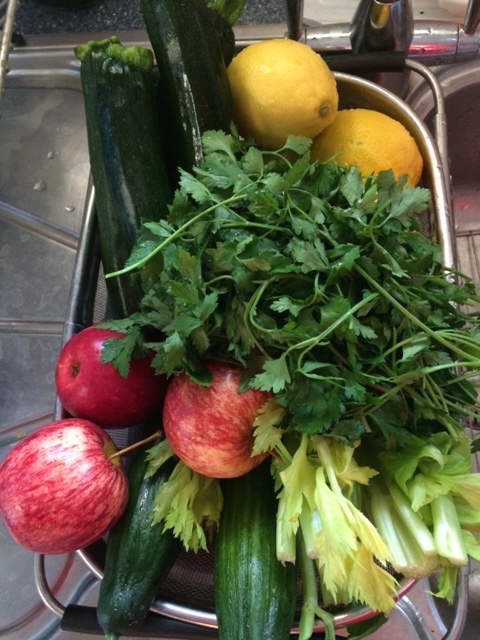 Tomorrow we will be starting 2-nd stage of this process – juice detox. Liver harbours lots of emotions. On a day to day basis not always we express ourselves freely, so some of those emotions get hidden away. When we detox, liver does physical and emotional detoxification. Thats why we sometimes see those hidden emotions beeing released. It could be anger, frustration, anxiety, depression. It’s a good feeling. My Mom after 3 days of detox says: my legs are very heavy, I barely can move them. She took a break from yoga and her exercises, so it couldn’t be that. We started thinking why she is feeling this way. My Mom’s brother died just before she started detox. She was flooded with lots of emotions – anger, frustration, sorrow… She didn’t released them, she hid them at the moment, because she had to attend the funeral, do her usual daily chores and on top of that prepare for the detox that she never did before. Her unreleased emotions “deposited’ in her legs. I asked my Mom to use the opportunity of detox not just for physical cleanse of the body, but also to look deep inside and to do some emotional cleanse as well. It took a day of TLC, and she felt better. For some people can take longer to clear emotional burden, it really depends how ready you are to do so. I am so happy for my Mom, detox came very timely for her. I felt a bit on edge first 2 days emotionally. I think a lot has to do with a change in daily routine. Even this is not the first my detox, I felt that my mind decided to do detoxification, but for my body it took 2 days to accept it. By the evening of day 2, something “flipped” inside me and all of the sudden I felt lighter and smiled. Today I had great energy and met my ‪‎fitness goals‬ – yoga and walking. Lovely green juice to start my fabulous looking day. I juice on the regular basis, but detox juices are a bit different. 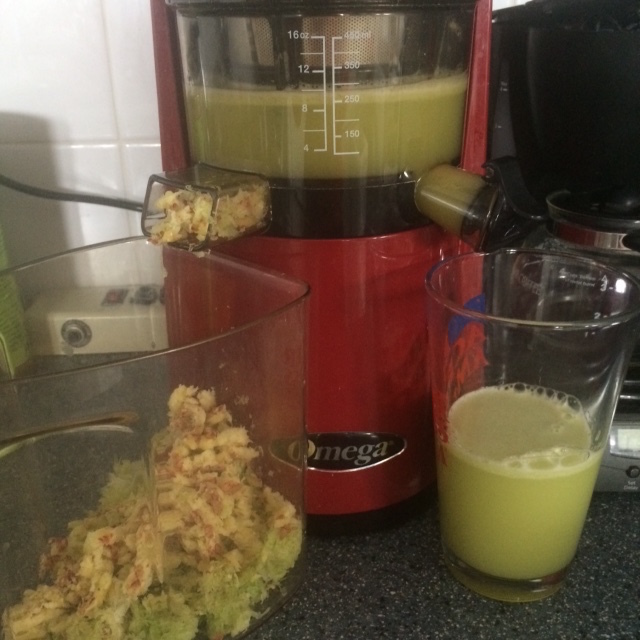 It sounds sckary – how will I function all day by drinking only green juices. Trully, I feel great – lighter in the body and mind. Today I picked up great energy. Surprisingly how pure juice works like “super nutritional blood infusion”. Because of my hypothyroism, I have tendency to feel colder than most people. During detox I really feel cold. I usually try to aim to do detox when it is nice, warm and sunny weather, but not always you can count on it when you are living in London. I even shared this experiece with my colonics expert I use and respect. She said that she and most of her clients feel the same way and it is a normal reaction when liver detoxifies to feel slightly colder than usual. 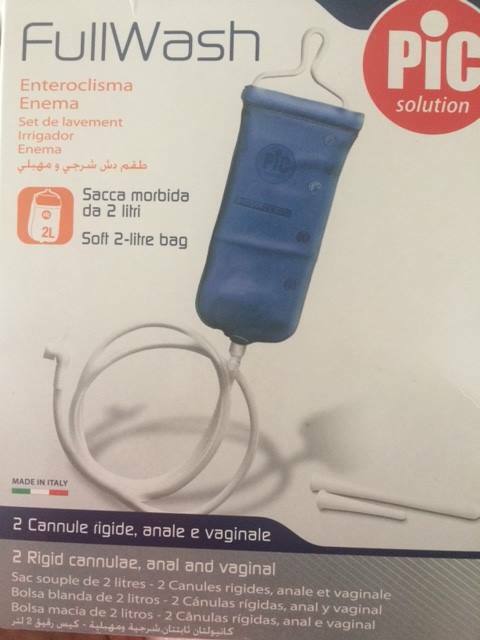 Especially after enema administration. I guess I will dressing up in lots of layers like “onion”. Have you ever had colonics and enema? 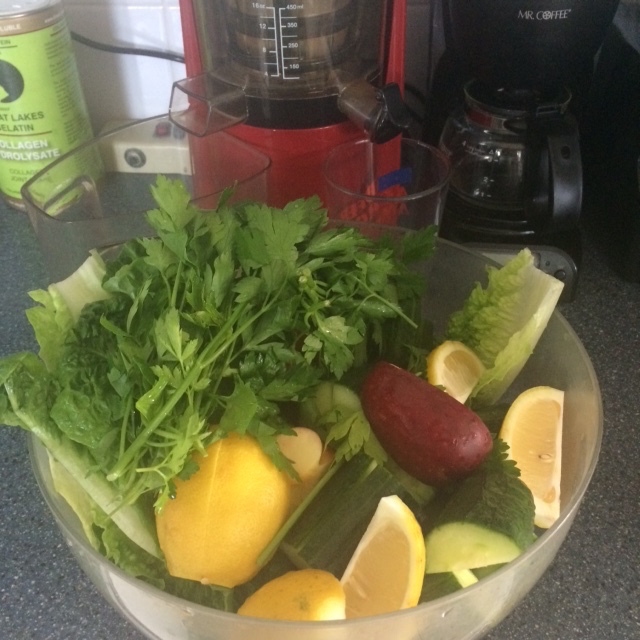 I like to have one session of colonics and daily coffee enema during juicing stage of detox. It’s amazing how well it makes me feel. Coffee enema super beneficial for liver detoxification. As the juices begin rebuilding the body and encouraging toxins to be released from the cells into the bloodstream, a great deal of stress is placed upon the liver. The coffee enemas increase liver filtering, greatly aiding the liver’s ability to remove serum toxins. Certain substances in the coffee stimulate an important detoxification enzyme in the liver as well as dilate the bile ducts and increase the flow of bile. A secondary benefit of the coffee enema is to increase peristalsis which helps to empty the bowel. So far I had 5. It is something we don’t talk much about it. Before I started doing it, I had lots of thoughts and excuses why I don’t want to do it. Once I started and got a hang of it, it is easy, simple and fast at the comfort of my own home. It takes a bit of commitment, but I wouldn’t do detox without it. Yesterday was Sunday, so I used the day to my full advantage – spa day! I spend all day pampering myself and helping body detoxify through my skin. 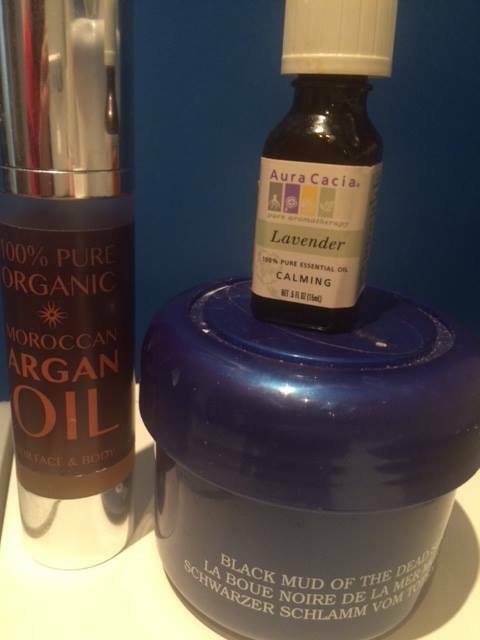 A nice face steam and a mask followed by a body coffee scrub and a hot soak in the lavender Epsom salt bath. I had all these coffee grinds from coffee enema, so I used it for a lovely body polish. 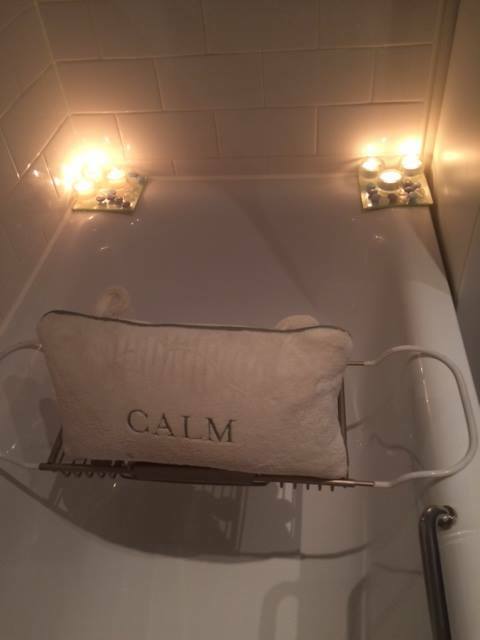 Soaking in a hot bath helped me to sweat, relax and detoxify through skin. It was a true relaxation. Love my detoxification process. Today will be our last day of 5 day juicing. Yesterday I treated myself to a nice massage. I love a good massage – it relaxes, assist in lymphatic system drainage and simply feels good. We need personal touch and hugs. It helps to produce happy hormone Oxytocin and once we are happy, we are feeling better, our bodies function more efficiently, we make other people happier and get the same in return. I don’t usually dream at night. But strangely enough, during this detox I have been dreaming every night. Dreams are very realistic. No wonder that people who want to meditate deeper or reach deep into their sole, they go on restricted food diet. It makes easier to connect with inner you and subconscious mind. Our family detox is coming to the end. Few days of introduction of lighter solid food before we jump in eating regular meals. I am very happy and proud of my husband and my Mom for joining me in this detox journey. We gave a rest to our bodies, treated ourselves well, nourished it with supreme nutrition. It wasn’t easy all the time. It is a commitment, but results are great. I didn’t mind a little hunger, I like green juices, I like how light and well intune my body feels, my skin is bright, no fogginess of the brain, some weight loss (I didn’t need or wanted to loose weight, but it happens). My least favourite moments – I have hard time taking clay-fibre shakes (I really dislike them), I don’t like that I feel colder. Would love to hear your experiences with detox and body cleanses. Please share. If you would like to contact me personally, email HERE. This entry was posted in Adrenal Health, Detox, Hormonal Health, Thyroid, Woman's Health and tagged Acne, Autoimmune disease, Digestion, doTerra, Essential oils, Fatigue, Menopause, PMS, stress, Weight Loss by vilmaswellness. Bookmark the permalink.